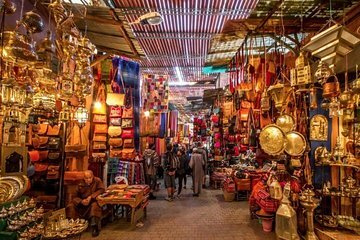 Aproveite o melhor da Medina de Marrakesh nesta excursão privativa de meio dia para compras. Com um guia privativo, aprenda a navegar pelas vielas cheias de lojas e descubra ótimos outlets de artigos de couro, lustres, tapetes, cerâmica, óleo de argano e muito mais. Conheça os artesãos, aprenda a pechinchar, descubra joias de compras escondidas, desfrute de descontos especiais e aproveite os refrescos berberes (por conta do visitante) no café dos moradores locais. Escolha uma excursão pela manhã ou à tarde e faça um upgrade para incluir o embarque e desembarque no hotel. Can't say enough about how professional, courteous and knowledgeable Hassan was. He picked us up on time and gave us an incredible experience in the medina. We would have never found most of the places he took us to. He also took us to stores in the Gulez section of Marrakesh, fantastic! He shared insights into the culture, food and history of Morocco. Definitely worth doing. Mixed feelings about this tour, our guide was lovely, providing relevant information and very pleasant with excellent English. He took us through the souks and workshops we would never had found on our own and then asked which items we wanted to focus on purchasing. But we didn't fully get the experience we expected. We didn't meet with artists and learn about their family businesses and their work, we didn't visit a local leather shop, a jeweller, fashion outlets or even a carpet shop, but we did visit a herbalist, shoe shop and a lamp shop but these were really expensive. I had hoped to learn the art of bargaining but the guide stepped back and provided no help or advice. Also there was no rest stop until I asked for one at the end of the tour. However it was a good introduction to the souks and helped our orientation on our first morning in Marrakech. This trip is amazing. Having a guide through the Medina means you get to experience things you would not do if you go on your own. Our guide Youssef was amazing and tailored our visit to our interests, sharing his vast knowledge as we went. As part of the tour, Youssef takes you to the workshops so you can see how everything is made and hear first hand from the workers how they make their goods. I can not thank Youssef enough for the amazing experience he gave us. Will be recommending to a friend who is looking to visit Marrakech soon! !